The concept of high end varies depending on what you are talking about and who you talk too. In this Evaluation Engineering Evaluation Engineering article the author discusses high-end oscilloscopes. I am mentioned several times in this article as part of my day job at Rhode and Schwarz. There I am a product manager for oscilloscopes in North America. We have scopes that range from 50 MHz to 8 GHz. For a little bit of context let me explain how this type of article works. The author, or editor, reaches out to some field experts. Each person is asked to fill out a written interview form. From there the author compiles the responses into a story like this one. This process is always nerve racking to me. I always worry I’ll misquote a specification or make a major typo. I don’t get see the article until it is published. 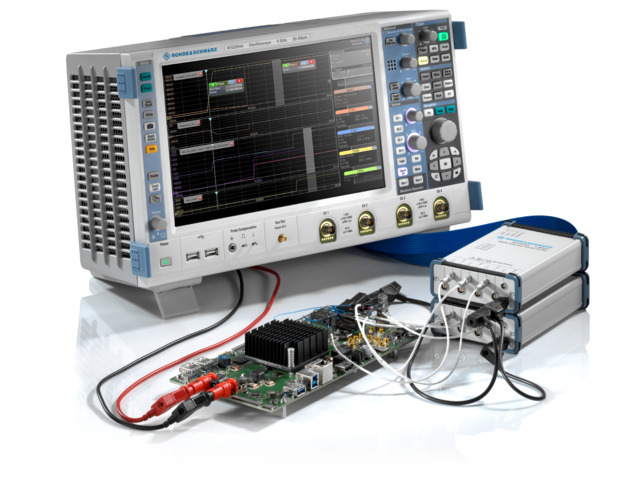 If you aren’t familiar with high bandwidth oscilloscopes, I think you will still find some value in reading about my favorite test tools. If I were a professional actor, I would feel typecast at this point in my career. Whenever someone wants to talk about Arduino, Oscilloscopes or Capacitors, they call me! In this case, element14 asked me to do two videos on how to replace multilayer ceramic capacitors (MLCCs) with Polymers. Polymers are an interesting capacitor type. What is usually called a “polymer” is better a called a “polymer electrolytic.” The reason for that detail is the word “polymer” describes the cathode layer and not the dielectric. For more details, why not check out this episode of element14 Presents’ The Learning Circuit! If you have questions about these capacitors, head over to element14 and leave me a comment there. Looking through my parts boxes, I have counted at least 15 distinct “Arduino boards” in my collection. Either they are variants of the Uno form factor or they have different processors from the 8-bit boards. That number easily goes to 30 if I include boards with just the “Arduino header” on them. 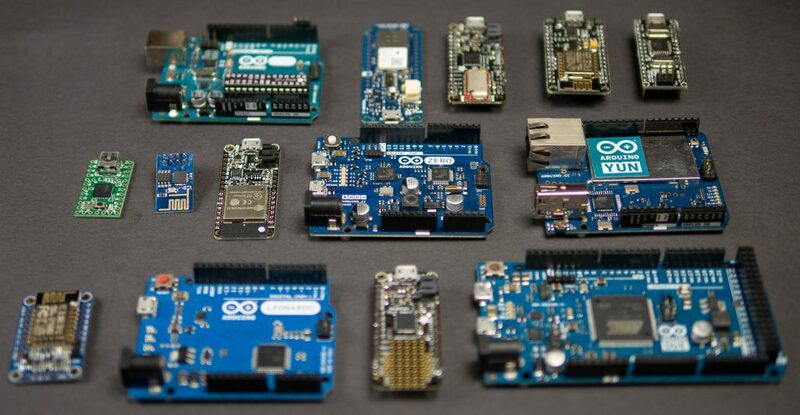 This pile of microcontrollers got me thinking, how does anyone ever choose the right board? For example, I have had several people tell me the ESP32 is the “ultimate Arduino.” But is it? Well, yes and no. 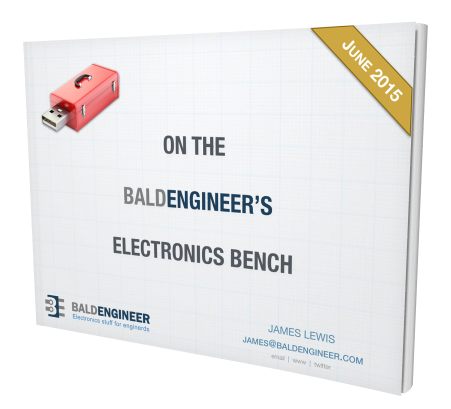 Extra hardware you do not need can lead to complexity and unexpected behavior. When using an advanced module like the ESP32, it is important to learn how to use sleep modes to limit current consumption, especially for battery applications. But if you need WiFi, Bluetooth, I2C, SPI, UART, and high-performance processing, capacitive touch, GPIO, and analog inputs then the ESP32 is an obvious choice. As for the other boards, I have written a guide to picking the right Arduino. You can find it over on the Hackster.io blog. Making tutorial videos and project videos is a very different process. It is very easy to script a tutorial. In fact, I think it is a necessary step. Project videos, on the other hand, are more organic. In this project, I build a capacitive activated coin bank, based on this Coin Acceptor from Adafruit. It uses an MSP430 to do capacitive sensing and then a Pryamiduino to control the rest of the electronics. In the end, I do some classic AddOhms special effects to demonstrate how the project works. For detailed notes and design files, hit the button below for the element14 project page. Over the past year, I have been a Hackerboxes subscriber. When the first couple arrived, I opened them up immediately. In fact, I got my first ESP32 through Hackerboxes. Previously, I wrote up a hands-on with the PicoScope 2204A. At the time I only spent a few minutes with the device. I used it to “debug” an I2C bus between an Arduino and OLED screen. Since that initial hands-on, I’ve used the PicoScope in my lab. Most notably, I hosted another “hands-on” via an AddOhms Live Stream. I used it for another live stream where I talked about op-amps. Unfortunately, the video isn’t watchable due to some technical difficulties. However, both of those activities plus debugging a new project I’m working on, gave me a chance to understand this humble USB-based oscilloscope. Now that I’ve held well over a month of bench time with it, I can say I am happy with the 2204A. 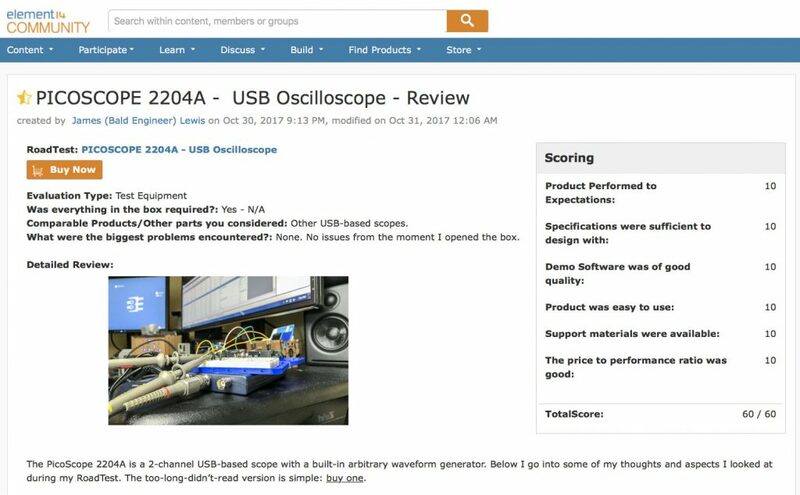 If you’re looking for a low-cost, but fully featured oscilloscope, give the PicoScope 2204A a consideration. For more details on why I feel that way, click the button below to see my full write review on element14. In this video, I discuss considerations for SSD Capacitors, with a focus on enterprise applications. (No, not the ship kind, the business kind.) As more consumer devices use solid state technology, it gets easier for us to forget the importance of keeping data safe during storage. While solid state drives are more robust than their spinning counterpart, they are not perfect. Just like with spinning drives, there is a small delay from when a write occurs until the data is stored permanently. The highest performance solid state drives parallelize data in a way to minimize this propagation time. However, these drives also keep an active copy of the allocation table in RAM. Just like the RAM in a PC, when power is lost, so are the contents. So it is critical for a solid state drive to have a reserve bank of energy to dump the RAM contents into permanent storage. Modern drives use huge banks of capacitors to write out any RAM buffers when the system’s rail voltage suddenly disappears. Learn how to choose Enterprise SSD Capacitors in the EE Journal Chalk Talk. This video was created in cooperation with KEMET Electronics, Mouser, and EE Journal.